Review of George Colligan's "Come Together"
All compositions by George Colligan except “Come Together” by Lennon/McCartney; and “The Shadow of Your Smile” by Mandel/Webster. Despite actively recording since 1996, I first heard George Colligan as a sideman on the fine Jamie Baum release “Solace” from 2007.His harmonic sensibilities were imaginative and unpredictable even in the subdued chamber jazz setting of Baum’s wonderfully expressive compositions. His work on guitarist Greg Skaff’s 2008 release "East Harlem Skyline” showed he is equally comfortable on the Hammond B3. Seeing him in person with Baum’s Septet at Joe’s Pub it was obvious that his unbridled energy was itching to break out on his own. He released “Runaway” as a leader last year and though it offered a glimpse of his potential, especially on “End of A Dynasty” it fell short of my expectations. The new release “Come Together” is a thoroughly enjoyable addition to his musical repertoire. Colligan and fellow band mates, Boris Koslov on bass and Donald Edwards on drums, were former members of the Mingus Big Band and the Mingus Dynasty. Their empathetic musical interaction is a result of these years together. 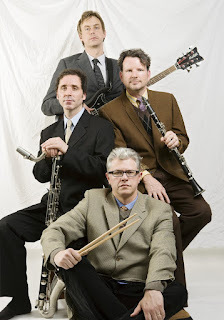 Colligan’s treatment of the Lennon/McCartney classic “Come Together” is not just another jazz rendition of a popular song. He infuses the Beatles classic with soulful funk and blues. Colligan’s driving cascade of notes and Koslov’s probing electric bass take the memorable melody line to new heights of exploration. Koslov is especially impressive with his rapid-fire Wooten-like bass runs. His deft and accomplished playing on both acoustic and electric bass was a revelation. With the exception of the title tune and the standard “Shadow of Your Smile”, a standout that Colligan plays in a sauntering and wonderfully free swinging manner, all the compositions on the album are originals. On the tempestuous “Venom”, a staccato piece that the trio plays at a relatively fast clip, the energy is palpable. Eventually they engage the afterburner by double timing the last chorus in a ripping finale that smokes. “Have No Fear” is another hard driving song that exudes megawatts of energy as Colligan plays block chords up and down the keyboard. Koslov takes a penetrating solo on acoustic bass and Edwards keeps impeccable time. “Lift” is a crescendo building composition that explores elements of fusion, where Koslov’s electric bass is featured. Colligan’s playing is explosive with his musical ideas erupting like molten lava from his volcanic keyboard. He has more than a passing deference to Tyner, especially in “To the Wall” which has moments of being eerily like a driving young McCoy with his powerful, percussive, chordally based playing. His two ballads “ So Sad I Had to Laugh” and “Open Your Heart” show a reflective side to Colligan. The former is particularly poignant, including deft brushwork by Edwards and a wonderfully expressive exchange by Koslov and Colligan including some subtle arco work by Koslov at the coda. On “Open Your Heart” Colligan plays classically inspired flourishes as Koslov demonstrates his emotive abilities on electric bass. Just when you think the song is treading on a predicable path Colligan suprises, as he so often does, with some of the most moving and nuanced improvisations on the album. With something for everyone, this expansive and approachable offering will undoubtedly add to George Colligan's growing reputation as a pianist and a composer with something to say. Track Listing: Come Together; Venom; Have No Fear; So Sad I Had to Laugh; Reaction; The Shadow of Your Smile; Lift; Open Your Heart; To The Wall; Uncharted Territory.Favorite Tracks are highlighted. Tucked away in the Ninth Square district of downtown New Haven , CT is a jazz music venue that offers an intimate setting in acoustically superb surroundings. 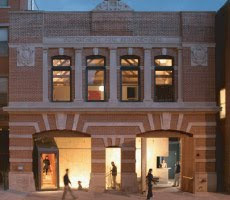 The Firehouse 12 is the brainchild of Yale alumnus Nick Lloyd. 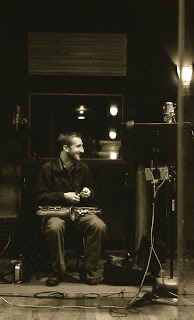 Four years ago Mr. Lloyd took a dilapidated old firehouse and with the help of acoustical engineer John Storyck (who also consulted on Jimi Hendrix’s Electric Ladyland studio) and local architect Gary Organschi created what may be the premier studio and performing space for jazz and alternative music in New England. You can tell that the space was designed with music as it’s top priority. Where many jazz clubs are relegated to lower level spaces, with angular walls and sharp edges, usually because the space is more affordable, here the studio and performance space are pre-eminently positioned on the first floor with the bar and lounge residing on the basement level. The glass walled, sound proofed control room features a large format analog control board with up to twenty four-track 2” analog recording tape capability. The adjacent performance space is organically designed with bamboo flooring and gently curved maple/birch veneered plywood ceiling. Behind the generous performance stage, an undulating wall of bent plywood panels ensures that the sound has no harsh surfaces on which to ricochet. The performance area is designed with no parallel surfaces in the space. The result is a chic; intimate setting that provides a comfortable environment for the audience while retaining demonstrable audio integrity. 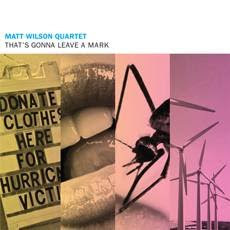 On this evening the Matt Wilson Quartet played songs from their most recent Palmetto release “That’s Gonna Leave a Mark”. As the title implies Mr. Wilson has a wry sense of humor that comes across in his music. 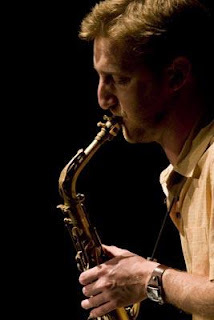 His quartet included the alto saxophonist and bass clarinetist Andrew D’Angello, the tenor and soprano saxophonist Jeff Lederer, Chris Lightcap on contra bass and of course Mr. Wilson on drums and assorted percussion. From the outset it was obvious that the audience was going in for a wild ride. The set started out with Mr. D’Angelo’s “Ambrose Ditty” which had the two saxophonists playing blisteringly explosive runs of notes in unison and in counterpoint. Mr. D’Angelo’s alto solo was crisp, jagged and unrelenting as he paced the stage with a feverish outpouring of energy. Mr. Lederer played in a more subdued, melodic manner and seemed to intuitively weave his sound into and around what Mr. D’Angelo was playing. Lightcap’s pulsing bass and Wilson’s propulsive drums drove the music to its conclusion. 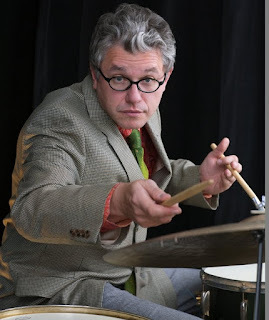 Mr. Wilson plays drums with an unvarnished joy. He still possesses that magical wonderment of a young boy, who on Christmas morning runs down the stairs to find a shiny new drum set under the tree and can’t wait to play it. In Mr. Wilson’s case the boy would be an immediate prodigy. On “Searchlight” he started playing his toms and snares with what appeared to be a child’s beanbag starfish with jingle bells on each of its points. As he patted the bag on his drumheads he created this rhythmic sound that was both purposeful and playful. The song conjured up images of a Middle Eastern bazaar with D’Angelo’s bass clarinet and Lederer’s soprano saxophone adding to the story telling like feel of the music. The woodwinds built to a loud crescendo before deftly lowering to a soft refrain that ended with Wilson playing chimes and Lederer’s soprano shrieks. “Don’t Blame Me” was an interesting venture into time and space. Played at a deliberately pondering pace. The time between Lightcap’s successive bass notes suspended them in surreal slow motion. This exercise in restraint allowed Mr. Lederer a chance to explore tonal quality on his tenor rather than on the quantity of notes played. He offered breathy, sustained notes that he held to perfection as he anticipated the lagging rhythm of Lightcap’s next pluck and Wilson’s next brush stroke. “Rear Control” is another D’Angelo composition featuring Mr. Lederer playing clarinet and Mr. D’Angelo on bass clarinet. The combined woodwinds play to an almost funky backbeat from Wilson and Lightcap. The sounds they create could be used as the soundtrack for a hip cartoon. The song breaks time often with Wilson punctuating the breaks with rolls, crashes and rim shots. 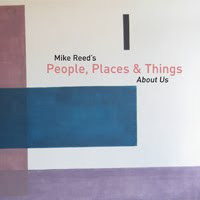 When clarinetist Lederer improvises on its quirky theme it is with a playful reckless abandon feel to it. D’Angelo’s bass clarinet sounds a little Dolphy-like as he muses more thoughtfully through his lower octave solo. Wilson’s humor is always present. On “That’s Gonna Leave A Mark”, the title tune from the Quartet’s latest album, we find Mr. Wilson starting off with a series of drum rolls as both Mr. Lederer and Mr. D’ Angelo play cacophonous bursts of atonal notes simultaneously on tenor and alto respectively. 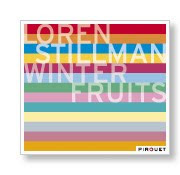 The song progresses with a free-jazz spirit that is an obvious tip of the hat to the influence of Mr. Ornette Coleman. Mr. D’Angelo is particularly frenetic on this number. He sways back and forth bursting into an energetic display of unrestrained and powerful screeches and wails. Mr. D’Angelo has been fighting a cancerous brain tumor for the better part of this past year and while he is now miraculously cancer free, this humbling experience has undoubtedly had an effect. His cathartic playing reveals a renewed intensity that somehow acknowledges life’s fragility and impermanence. According to Mr. D’Angelo’s blog, this appearance in New Haven was the last of his tenure with Mr. Wilson’s Quartet, an association that has spanned fifteen years. As he wrote, it was time for a change and a time to release the old. As part of his ongoing, life changing experience Mr. D’ Angelo will be climbing to base camp one on Mt. Everest in Tibet during October. We certainly wish him well. His explosive sound will be missed. On Mr. Wilson’s hymn-like “Come and Find the Quiet Center” we were treated to the mellow and reverential sound of this wonderfully evocative melody. While Mr. Wilson played ever so lightly on brushes, Mr. Lightcap gave a stirring bass solo that was accompanied by the subdued but woody sounds of Mr. D’Angelo’s bass clarinet. Mr. Lederer’s soulful tenor bellowed with the hallelujah appeal of a fire and brimstone preacher calling on his flock to give praise. Mr. Wilson’s special brand of music is both entertaining and challenging offering those who experience it a chance to stretch their musical boundaries without going into totally alien territory. With his innate humor, formidable talents and unbridled joy Mr. Wilson gently guides us as un-jostled passengers into the new musical landscapes of his compositions.